ASTORIA, Ore. — The crew of Coast Guard Cutter Alert will return to Astoria Sunday at 6:30 p.m. following a counter-drug patrol in the eastern Pacific Ocean off the coast of South and Central America. Alert’s crew members successfully conducted a 70-day patrol traveling more than 12,600 miles scouring the eastern Pacific Ocean for illicit traffickers using their two small boats and armed helicopter from Coast Guard Helicopter Interdiction Tactical Squadron from Jacksonville, Florida. These efforts resulted in the successful interdiction of more than 3,180 pounds of cocaine. 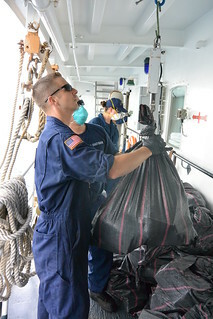 The cutter’s crew worked jointly with Customs and Border Protection, the Drug Enforcement Agency, and other domestic and foreign military services to stem the flow of illegal drugs entering the U.S. and combat transnational organized crime networks. The Alert’s crew interdicted three suspected vessels, detained 15 suspected smugglers, and seized over 3,180 pounds of cocaine with a wholesale value of more than $48 million. “Never in my wildest dreams did I expect to play such a pivotal role on my first patrol and to help out my shipmates,” said Seaman Kristian Franco of Corona, California, who graduated from Coast Guard boot camp at Training Center Cape May, New Jersey, this summer. Franco was relied upon heavily as a Spanish translator to effectively communicate with partner nations. Alert is a 210-foot medium endurance cutter with a crew of 76 personnel homeported in downtown Astoria at the Columbia River Maritime Museum. The crew conducts search and rescue, drug interdiction, defense readiness and environmental law enforcement missions over vast expanses of the eastern Pacific Ocean along the West Coast of the U.S. and Central American partner nations.